Martha Rogers, author of historical and contemporary romance novels, is joining our chat circle this week. Welcome, Martha! We’re delighted to have you. Martha’s giving away to someone who joins the conversation below their choice of a print copy of Christmas at Stoney Creek, which is set in Texas in the 1890s, or an ebook of Thanksgiving in the Valley. So comment below, and you might be the blessed winner of one of these lovely stories. First, thank you, Linda, for inviting me to your blog. I was born in Dallas, Texas 82 years ago and was my parents’ first child and the first grandchild on each side. I have a younger sister and brother who still live in the Ft. Worth-Dallas area. I attended Kindergarten through grade twelve in Dallas. In fact, my family never lived anywhere but in Dallas. 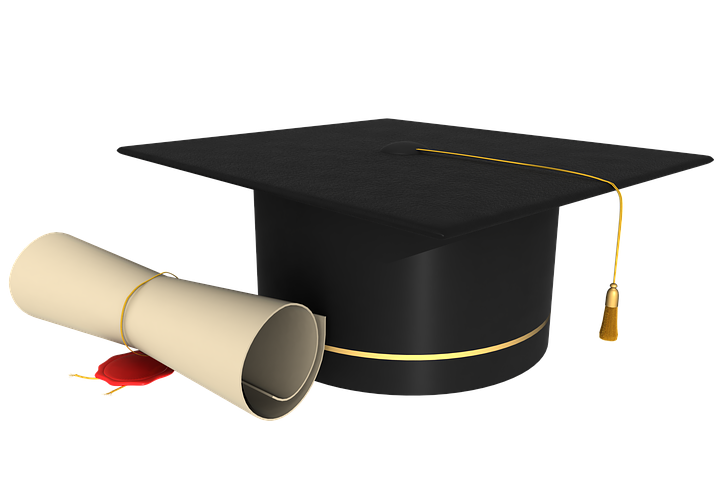 After high school graduation, I attended Baylor University where I earned a Bachelor of Science degree with a minor in English. My days at Baylor were full of fun as I participated in as many activities as I could and still do my studies. I liked to talk, socialize, and play pranks. Many times I found myself on the borderline for being “Campused” which meant I could not leave the campus for the rest of the semester and restricted to the dorm with only my classes to attend. Never made that list because I knew the limit and never crossed it. 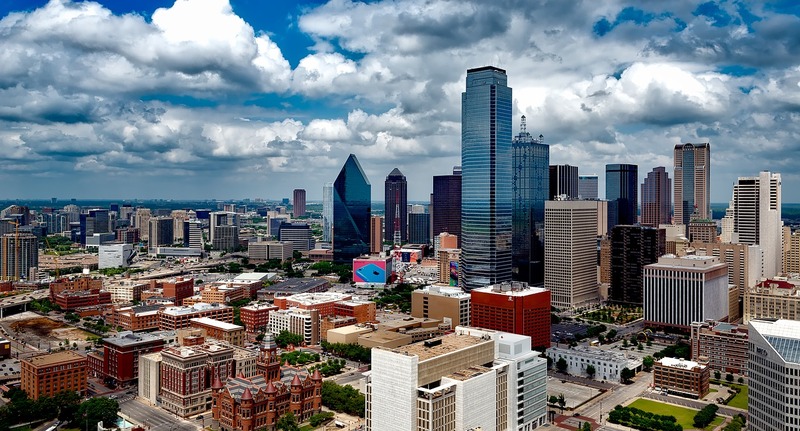 I had never lived outside of Dallas until going to Baylor, and when I graduated in 1957, I accepted a job in Houston and have lived here ever since. I met my husband at First Baptist Church in Houston in 1959, and we married that year. We remain members of that church even today. 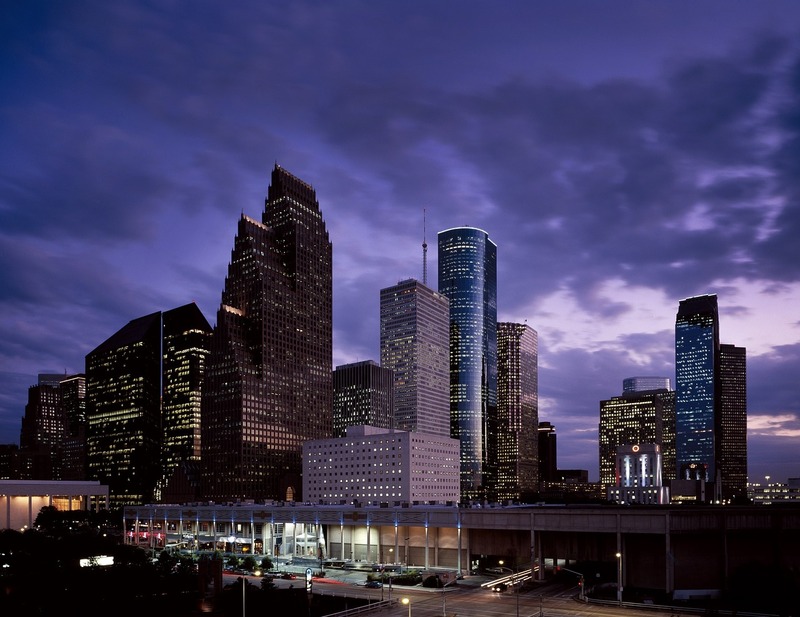 I attended the University of Houston and earned my Master’s of Education and went on to teach at the college level for eight years. We have three sons and daughters-in-law. The oldest lives in Waco, Texas, the middle one is here in Houston, and the youngest lives with his family in Tulsa, Oklahoma. They have given us nine grandchildren. The youngest grandson is a sophomore in high school. Our two oldest granddaughters are married and have given us five great-grandchildren. Last fall, our third oldest grandson married and our family grew. 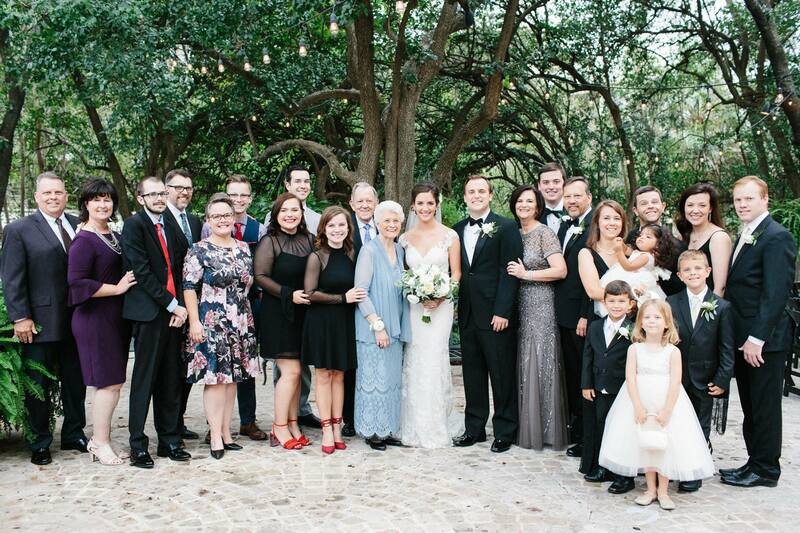 Here we all are at the wedding in San Antonio, Texas, the bride’s home town. 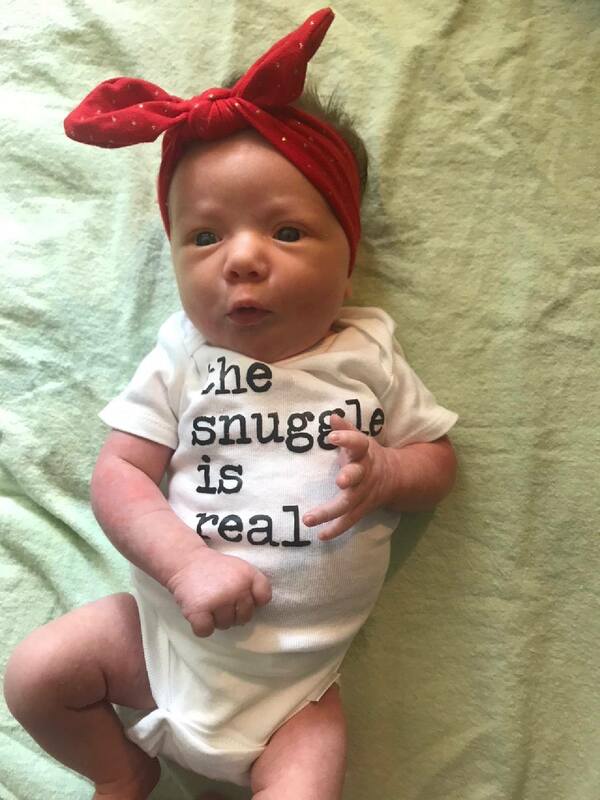 Our fifth great-grandchild joined the family in July of this year. Her name is Hailey Kate and we think she’s adorable. Then last December, we had a snowfall that actually stayed around, a rarity in Houston. 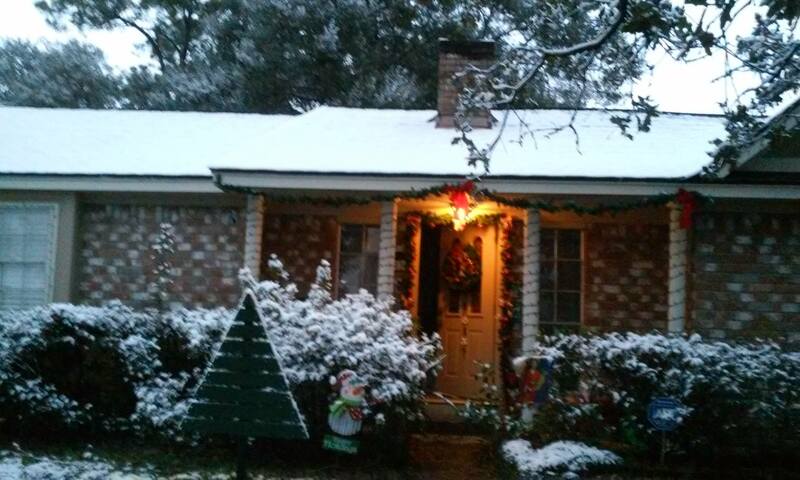 Here is our house with the snow. The trees kept the ground from being fully covered. We’ve lived in this house for forty-three years now. I began writing and telling stories as a young child and wrote my first novel at age seventeen while at Baylor. I wrote short stories and filed them away, but never did anything with them. While teaching a creative writing class for high school students, I decided to write the book I’d been making notes on for several years. 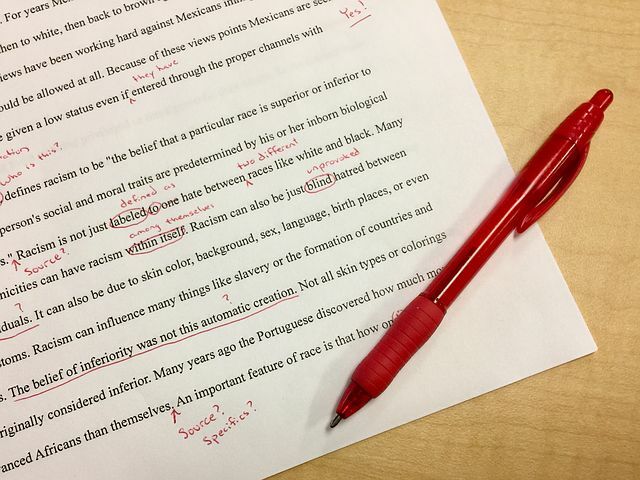 I wrote mainly in the summers because English teachers have very little time after grading papers for 150 or so students. I signed with an agent in the early 1990’s, but got nothing but rejections. We parted ways after three years. 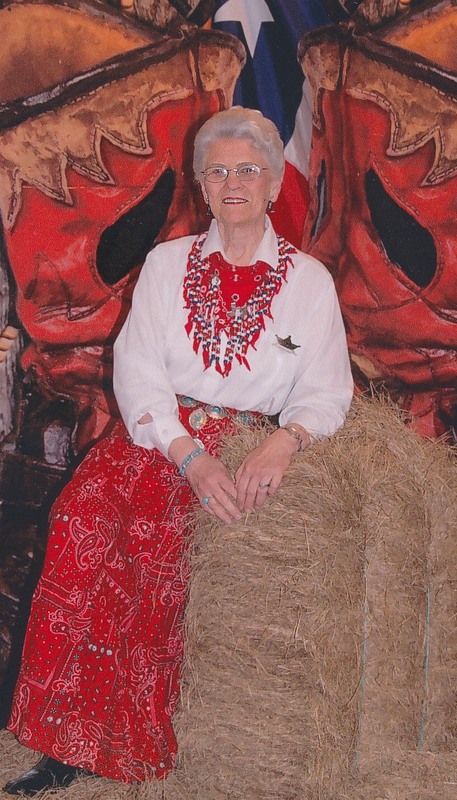 I continued writing and attended many writing conferences including Mount Hermann and the American Christian Romance Writers then later when it became ACFW. At an ACRW conference in 2001, I met and signed with my present agent, Tamela Hancock Murray. My critique partners, DiAnn Mills, Kathleen Y’Barbo, and Janice Thompson, decided we needed a collection of stories to submit for a collection. 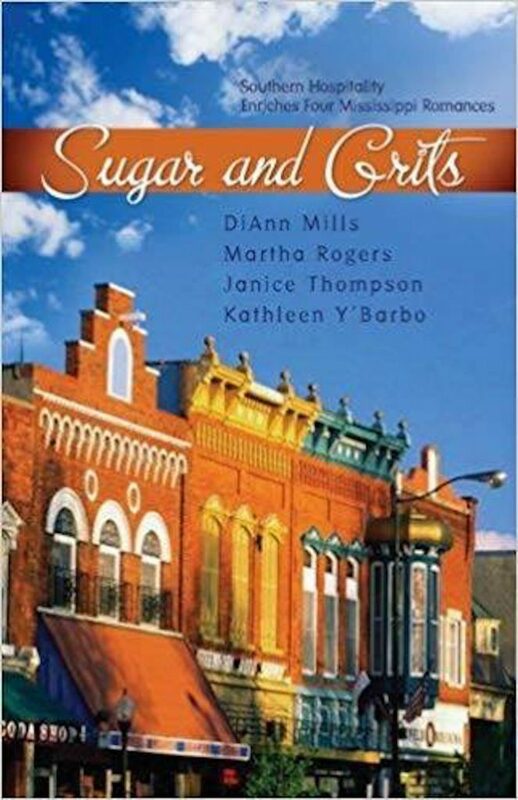 In 2007, Barbour published Sugar and Grits. This was one of the most fun books I’ve ever written. I had nothing else accepted, but Tamela Hancock Murray, my agent, continued to send out my manuscripts. DiAnn, Janice, and Kathleen helped me come up with the title for a series I wanted to write and the title of the first book. Finally, in 2009, on my seventy-third birthday, Tamela called with the news the first manuscript, Becoming Lucy had been accepted. After the first manuscript, they sent a contract for the rest of the series that ended up being six books. The series, Winds Across the Prairie, is still available today. Lucy became a CPA best seller as did the sixth in the series, Christmas at Holly Hill. After that first series, I contracted for two more of four books each. Now I have published fifty novels and novellas and have contracts for more in 2019. My newest releases are for two historical Thanksgiving and Christmas books, and two other contemporary ones. I am now working on a cozy mystery for a series titled Spring Hill Sleuths. It’s set in a retirement community and my main character is in her 70’s and is much like Miss Marple or Jessica Fletcher. Her cohorts include a retired lawyer and a retired police detective. It’s a lot of fun to write with a number of quirky characters. I’m planning on writing as long as the Lord allows and gives me ideas. God is my Master Creator and fills my head with ideas. He has walked with me though my own cancer and my husband’s heart attack and his battle with melanoma. Without my Lord, I am as sounding brass or a clanging cymbal. This is the print book I’m giving away. 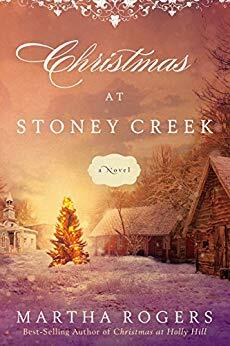 Christmas at Stoney Creek is set in Texas in the 1890’s. Although entirely fiction, the hero is named for my grandfather who was a newspaperman. Blurb: News reporter Tom Whiteman befriends a homeless man, Joe, and brings him home to Stoney Creek. Tom’s journalistic instincts suggest there’s more to the old man than appearances tell. A carpenter by trade, Joe works at odd jobs around town and makes many new friends including Faith Delmont, a girl who grew up with Tom. Contradictions in the man’s manners and way of speaking whet Tom’s nose for news and raises even more questions. As he and Faith seek the truth, they learn that God’s love can turn tragedy and loss to triumph and true love comes to those who seek it. If you prefer an E-book, then I have Thanksgiving in the Valley for you. Blurb: Travis fell in love with Violet when she was fourteen. Now, ten years later, he returns to Ridgewood Valley as a lawman and still loves her. 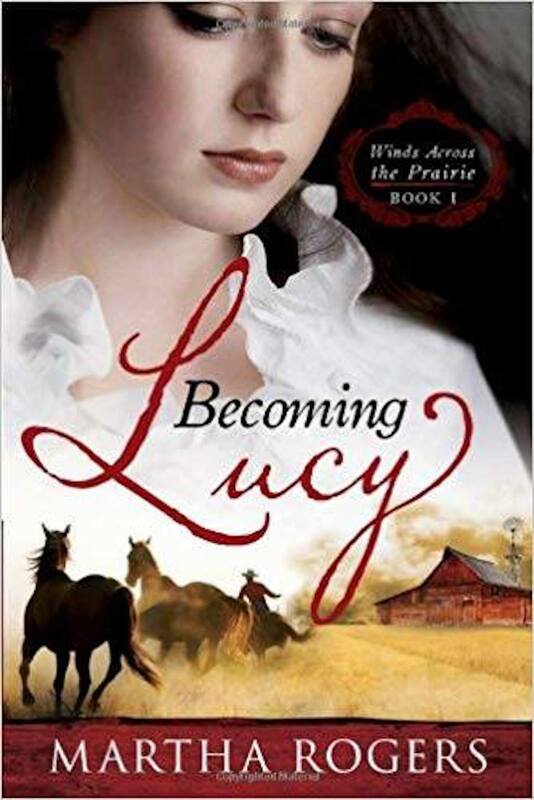 Violet has always loved Travis and when he returns from serving in the U.S. Cavalry, her love grows. Because she’s a preacher’s daughter, and he has less than stellar reputation while in the cavalry, he doesn’t feel worthy of Violet’s love and tries to avoid her. A few days before Thanksgiving, while he is away on a man hunt, Violet is shot during an attempted robbery of the church’s offerings. When Travis returns to town learns of Violet’s injuries, he realizes he can’t live without her. Will this Thanksgiving Day be one of great blessings for these two hearts? Lord, You are the eternal time setter. You know the times, the seasons, the hours, and the days, and you have from the beginning. How inspiring Martha’s story of Your giving her a family to rear and then placing a pen in her hand to write stories about Your amazing love and grace. Please bless each word Martha writes for you. I’ve been an avid Martha Rogers fan since Sugar and Grits. Spring Hill Sleuths promises to be another great read, too. Thanks, Linda. It’s fun writing about older characters and adding a few quirks and fun for them. Book 2, The Case of the Missing Pearls should be out in January. Thanks for stopping by, Alison. It was fun chatting with you on Facebook last night. Martha, I so enjoyed reading about your life and your writing journey! The Lord has truly gifted you and blessed you! I was just perusing through all your books that you have listed on Amazon…7 pages worth!! That is awesome! So many delightful reads!! Thank you for the chance to win a copy of your book, Christmas at Stoney Creek! I love Christmas stories and this sounds sooo good! A beautiful and full life for you, Martha. What a blessing with all your family being together and another special great granddaughter to love. I look forward to reading your books. They sound like ones I’ll enjoy. Christian Historical Fiction is a favorite. Linda and Martha, have a blessed and wonderful Thanksgiving with loved ones. God is good all the time. Thank you Marilyn. May your Thanksgiving be blessed as well. All of these books sound like great reads! both books sound great. Love to win Christmas at Stoney Creek. Hi Martha Thank You for sharing You are new to me Would Love to read Your book Christmas At Stoney Creek! Your Great Granddaughter is Adorable! Happy Thanksgiving! Thanks for stopping by, Sarah. This Christmas book was fun to write using my grandfather as the model for the hero. May you have a Happy Thanksgiving as well. I forgot to add, Sarah that was my great-grandmother’s name. They called her Sallie for some reason even though her name was Sarah Louise. She’s the mother of the hero in Stoney Creek. I have never understood why, by Sally/Sallie has always been the nickname for Sarah. I’ve known others. It’s cute. I also went to Baylor and absolutely loved my time there. Still follow the Baylor the Bears!! Thanks for the chance to win! Thank you for sharing. Enjoyed reading. Have a blessed Thanksgiving. You too, Lucy. I love this time of year. Thanks for stopping by. Seems like it took forever, Perrianne, but it was all in God’s timing. He knew when I’d be ready. Paula, I hope your daughter likes Dallas. That’s where my youngest daughter-in-law lived. She and our youngest son are now in Tulsa. I love that town. Thanks for stopping by. My daughter and her family are moving to Dallas soon. She lives near Tulsa, Oklahoma presently. Thank you for filling us in on how you got your start writing. You are an extremely patient woman! But the story goes that Texas women are tough. I wasn’t born in Texas but got here as fast as I could. My hubby and two sons are native Texans. Hi, your new to me but this book sounds great..i want to read it!! Thanks for stopping by, Patricia. I always love it when new readers come on board. Spring Hill Sleuths sounds like a fun upcoming series. I haven’t read many cozy mysteries, but that sounds like a cute setting/premise. Christmas at Stoney Creek sounds more like my typical read, I would love to win a copy.